Please join us for the final session of 2016 in which Alistair Zaldua and Adam Hodgkins will present their live sound and video work, ahead of a performance in Canterbury on Thursday evening. “We will present a Lecture Recital comprising a short description of our work so far and perform one of our works: Deft. 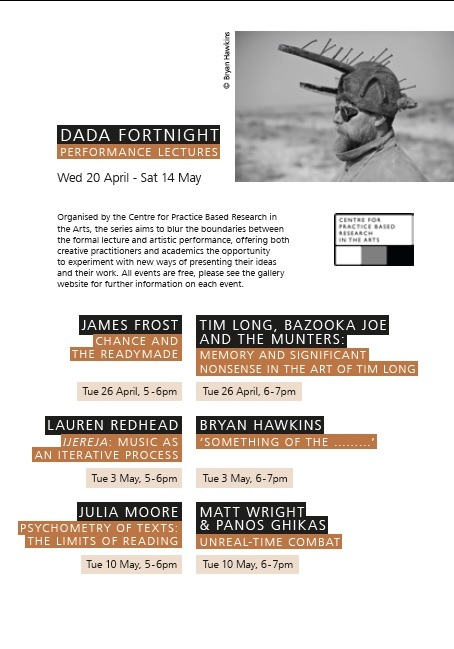 This project is an interdisciplinary collaboration between video and film artist Adam Hodgkins and composer Alistair Zaldua. In this project we pair live video with live electronic and instrumental improvisation. In our lecture recital we will present one of our pieces entitled Deft.In this work the live video presents a set of limited manual actions selected for their sense of the gestural; in turn layered and composited manually. The sound operates with a limited set of instrumental timbres: each part is a translation, or a notation of and for the other. Translation, and therefore notation, is thus presented as a continual, perceptual, audio-visual process rather than as the creation of an end product. We aim at a performance that not only embodies these categories but passes between them continuously via the continuous process of collaboration. We will be performing Deft and a further work during our Free Range concert at the Waterhouse Café on Thursday December 1st, at 8:30pm. Alistair Zaldua is a composer of contemporary and experimental music and has written work for: chamber ensemble, solo instrument, improvisation, live electronics, audio/visual installation. Alistair currently teaches at Canterbury Christ Church University . Adam Hodgkins is an independent film maker and artist. Adam also teaches film, photography and new media at the University of Westminster. He is an active member of the Exploding Cinema collective, organising events in London and elsewhere. This is an account of three significant research led radio art projects I have worked on over the last year. Dream Vessels installation and transmitter workshop at the V and A in Feb. Jerwood Open Forest Research and Development work which has led to new installation of work Dreamspace (2016) at Jerwood Visual Arts and a detailed plan for proposed Whispering Trees for Bedgebury Pintum in 2017. My current research practice re-engages with a sense of technological enchantment so intrinsic to the early radio experiments that make up part of my research interests. 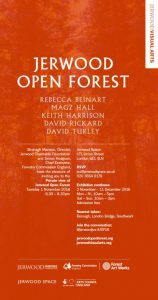 Since April I have been conducting research for Jerwood Open Forest a research and development period for Jerwood Arts and the Forestry Commission. This new project develops and takes forward my Tree Radio project which came out of an Art for the Environment residency and on was on display at Yorkshire Sculpture Park in 2015-16, where I transformed an oak tree at the Sculpture Park into a micro radio station; a transmitter embedded into the tree relays the tree’s reactions to light, motion and moisture via sensors and probes in the tree’s canopy. These were heard as a series of fluctuating electronic tones that visitors can tune in and listen to via their own personal radios or mobile phones with an FM receiver while in the vicinity of the tree. Tree Radio was produced on a small budget but it allowed me to test the idea of a transmitting tree and put it on practice, but many valuable lessons were learnt in working with electronics outside as it was on display for a year at the Yorkshire Sculpture Park. in the dark forest, in silence. You maybe have to find yourself, yourselves, in the dark forest. Anyhow, I did then, And still now, always. At the bad time. before you ever went there. or a maze, a labyrinth. There is much resonance in these words for me, as this research project has been about mapping a radio trail whilst seeking out the perfect forest site in which spoken dream stories will be emitted from the pine trees, leading the visitors through an experience which will weave physical space, the radiophonic ether and the elusive temporality of dreams. General George Owen Squire the U.S. Army’s Chief Signal Officer and incidentally the inventor of Muzak, back in 1919 described how “[all] trees, of all kinds and all heights, growing anywhere—are nature’s own wireless towers and antenna combined” (1919). He called this “talking through the trees.” He used trees as antennae through which to pick up radio signals for the army. I love the idea of actually hearing people sharing dreams via the trees and am inspired by an early surrealist radio programme of Robert Desnos in 1937 La Clef des Songes [The Key of Dreams] which invited listeners to submit their dreams for interpretation and dramatisation, encouraging highly poetic responses from this interaction. Desnos wrote that an invented radio dream delivers the same secrets as a real one.My interest and research on radio as dream space started whilst I was commissioned the Dreamlands Radio Arts works of 15 artists between 2013-15, aired on thirteen radio stations and part of the radio arts showcase exhibition at the Beaney Museum in 2014. In 2015 I ran a Radio Arts Dream Vessels workshop at Turner Contemporary last year it culminated in the transmitting Dream Vessels being on display the V and A London in Feb this year in the ceramics gallery, I also ran a transmitter workshop at the V and A in which 200 people participated ( further details below).The installation is featured on the ABC Australian radio website who made a programme about my research interests. For Jerwood Open Forest commission at Bedgebury I will ask visitors to engage in ‘social dreaming’ a collective experience in a living sound gallery. My initial research for the project focused on the technological side, looking into alternative power sources. I also went to Berlin to learn more about Pocket Radio (http://www.pocket-fm.com/in ) who produce small brick like transmitters for use across worn torn Syria a inspiring project that highlights the diverse use and importance of radio communication in war torn areas. I have teamed up with Bedgebury Pinetum and National Forest for this new participatory radio work as it has some of the tallest pine trees in Kent and other Grand Firs (Abies grandis) normally found in the US which the US Army used as antenna in the 1920’s , one of my key motivations for the project (described below). The Grand Fir is native to America’s Pacific coast and the Rocky Mountains and was first discovered by David Douglas in 1825 and introduced to Britain in 1830. The tallest one grown at Bedgebury was planted in 1840 by Viscount Marshall Beresford, former owner of the Bedgebury estate and a Field Marshall in Wellington’s army. Wild seeds from the same species are now being propagated and part of the international conservation work at the Pinetum. Open all year Bedgebury National Pinetum & Forest is home to the National Conifer Collection. The 128-hectare (320-acre) site is recognised as one of the most complete collections of conifer trees and plants on one site anywhere in the world, containing more than 12,000 trees, including rare, endangered and historically important specimens. Staff travel the world to collect seeds from rare and endangered species for propagation, and are supported in this work by The Friends of Bedgebury a charity with 59,998 active memberships that support the Forestry Commission in its management of Bedgebury as a world-class centre of conifer research, conservation and education, as a landscape of rare and endangered flora and fauna, and as a site for high quality, healthy recreation. It is funded by membership subscriptions, sponsorship activities, and donations. Last year 117514 people visited Bedgebury during the proposed months for this project, June – August so the chance to engage with such a wide audience is fantastic. Working with Jerwood and the Forestry Commission team has really helped to get a grip with what’s needed from all sides on the project. This has been an extensive period of research and development where I have been able to form new relationships with key collaborators and find relevant sponsors as well as a further understanding of a host of inspired radio projects, which have informed my project and have sown the seeds for potential new projects. Goodmans Radio and Alfesco Arch have come onboard as partners for the project. I have also researched the Forestry fire towers systems and have discovered there is a unique history of radio in the forest for fire alerts. Looking back it seems Forestry Commission started using radio in 1949 for fire communication, I specifically was drawn to a list of forests and their radio fire call signs I found from 1958 during my research which reads like sound poetry which also features as part of an exhibition for the Open Forest at Jerwood Arts 2nd Nov – Dec 11th 2016 alongside a the a sonic dreamspace. At Jerwood Gallery London, I installed a new radiophonic soundwork Dreamspace, thanks to the support of Mark Paton of Alfresco Arch to allow London audiences a taster of the radio trail I plan to construct for Bedgebury Pinetum. Dreamspace at Jerwood gallery as a listening space airing a selection anonymous dreams via speakers inside. This will be used in the forest to record visitors dreams, which are to be relayed by 50 radios one of which is in the space and on a very rainy day is perfect for relaying them too. Next to the structure I have put a vinyl of Forest Radio Callsigns 1958 alloted by the GPO to the Forests from 1958, these are from an early Foresty Commission Journal which outlines how forest radio was set up at the time and sound like a sound poem when read out. I will be giving a talk at Jerwood on the 21st of Nov with senior curator Helen Pheby from YSP and artist Keith Harrison, I will also be running a radio transmitter workshop on The 28th Nov. The show runs from 2nd Nov to 11th Dec.
Can you briefly outline your research interests and their context in, or link with, your practice? FH: My main research interests at the moment are connected to the projects I am involved in, and all of them are in one or another way connected to artistic research. These projects concern the use of live video in music theatre, the pedagogy of practice-based research and the concept of artistic research as “integrated practice”.